Methven, a global designer and manufacturer of premium showers, has extended its portfolio of Satinjet showers with new Kiri and Kaha designs. The Satinjet showers use twin-jet spray technology to create the optimum water droplet size and pressure offering 300,000 droplets a second. Featuring an updated sleek and sophisticated all chrome exterior, the refreshed Kiri MK2 shower has been designed with a new handset and shower rose. The Kiri range incorporates a thermostatic shower valve that maintains a safe and consistent water temperature. The cool to touch bar featured on the shower has been designed to ensure an always cool exterior, preventing the brass body of the valve getting hot. Kiri is also fitted with an ‘easy fit’ chrome-plated rail with adjustable mounting brackets. The Kaha collection features a brand new design and a shower head which is said to ‘guarantee’ maximum water coverage. At the slide of a button, users can choose from two showering options: a refreshing and invigorating body shower and a relaxing and tranquil shower massage mode. Staying on trend with a chrome finish, all of the products within the range come with a five-year guarantee. Similar to the Kiri range, the Kaha also comes fully fitted with a cool to touch thermostatic shower bar and both ranges feature an easy fit shower kit, perfect for an easy install. 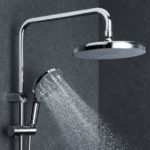 The company believes that its patented designs can also help customers save up to 50% on energy costs and up to 55% on the cost of water used in the shower.